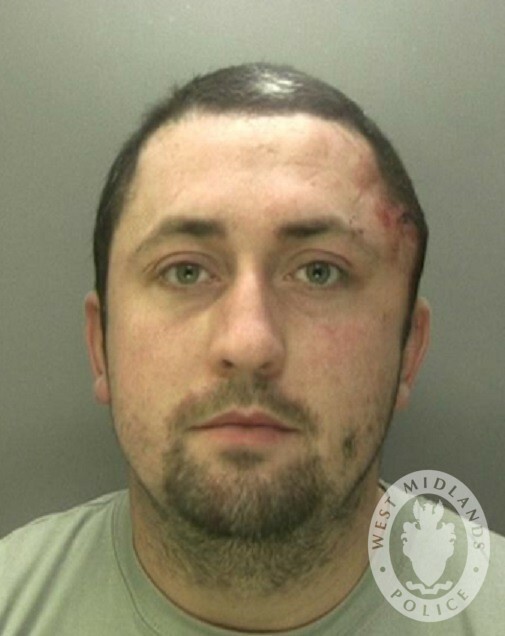 Grant Gold stole the Ford Transit from Lundy View, Kingshurst, at 1pm on 11 November last year but less than three hours later police were on his tail after the van triggered an Automatic Number Plate Recognition camera near the NEC. Officers picked up Gold on Bickenhill Parkway and, after pulling a u-turn on the roundabout, began pursuing him on blue lights at speeds of up to 90mph. The 27-year-old failed to stop and nearly toppled the high-sided van as he negotiated roundabouts and bends at speeds well in excess of the legal limit. Police dash-cam footage shows Gold career through single-lane traffic calming, narrowly avoiding other cars, and mount a pavement to avoid cars that had stopped at the scene of a crash involving a Focus ST stolen by Gold’s accomplices from the NEC. He goes on to speed through Marston Green and at one stage goes off-road as he ploughs through a fence, over grassland and along a narrow public footpath. But his bid for freedom came to a dramatic end when he collided with a smaller van in Station Road and − dazed from the impact − veered into the village’s war memorial. Gold, from Skye Close in Smithswood, was arrested running away and went on to admit aggravated vehicle taking − a charge that encompasses dangerous driving − plus vehicle theft in relation to the Ford Focus ST.
And at Birmingham Crown Court on Friday 11 January he was jailed for 22 months and banned from driving for three years. Investigating officer, PC Sarah Harvey from Solihull Police’s Investigation Team, said: “Gold placed many road users and pedestrians at risk due to the nature of his driving − it’s lucky that no-one was seriously hurt or killed. “He admitted taking the van and dropping two unknown accomplices − who ran away from the crashed ST − at the NEC knowing they were intending to steal another car. A ‘relay’ device − used by crooks to steal vehicles without need for keys − was found in the crashed Ford Focus. Efforts are on-going to try and identify and catch the two other offenders who made off.